Horton Spice has a long history of providing customers what they need from this critical area. Whether you are a Food Service Company or a Commercial Bakery, Horton Spice has the experience and services to get your critical function right. With over 1000 spice and herb blends and 87 flavour and colour blends developed at Horton Spice Mills, you can trust us with your needs. We can re-engineer any formulation that is currently in use depending on the customers’ needs. We also have the research capabilities to create the exact flavour you are looking for. It all starts with buying a fresh raw material product in bulk and then grinding just in time for maximum freshness. The final blend produces the optimum result. 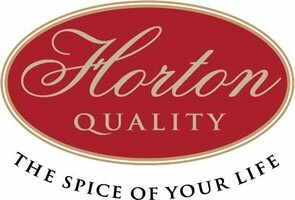 This is how Horton Spice Mills has gained a reputation for delivering superior quality products. Food Service and Commercial Bakeries: Try our private custom blends! We manufacture all of our products using Good Manufacturing Practices and following HACCP guidelines.